A bassinet is a small type of portable baby bed that is often used for newborn babies. Many parents use a bassinet for their newborn since it's easy to move from room to room and it can be placed right next to the parents' bed for nighttime feedings. Getting your newborn to sleep in a bassinet requires a consistent approach to putting your baby to sleep. While it can be tempting to place your baby in bed with you, it's not safe. Kids Health recommends that a baby be placed on it's back, inside a bassinet or crib, to sleep safely. Create a consistent routine for your baby. Consistent routines and cues for sleep help the baby get sleepy in anticipation of being placed in the bassinet. Bathing, feeding, putting on a fresh diaper, gentle rocking, a lullaby and then putting the baby in the bassinet are a typical routine for many newborns. Make sure your baby is awake when you put him in the bassinet, if possible. While many newborns fall asleep while nursing or being fed a bottle, it's helpful to teach the baby that sleep time is something he can do on his own. Once you've finished a nighttime feeding and changed his diaper, put him in the bassinet when he's drowsy, but not yet fully asleep. This will help him learn to settle himself. Swaddle your baby, if she likes to be swaddled, by wrapping her in a receiving blanket. Newborns are used to a relatively squashed environment, so a tight swaddle can help your baby stay asleep longer. 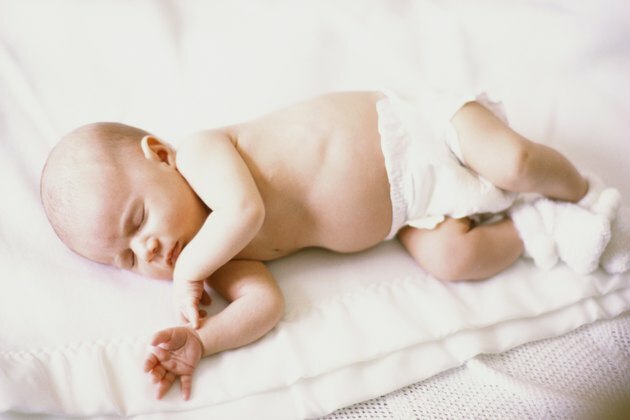 Not only can swaddling be a source of comfort, but also it helps minimize the startle reflex that can wake your baby. To create a swaddle, fold the blanket into a large triangle and place your baby in the middle. Cover the baby with one side of the blanked, wrapping it tightly around her body and tucking it under her. Take the other side of the triangle and fold it across the baby, again tucking it under her body as you place her in the bassinet. Sing the baby a lullaby or read him a story once you've placed him in the bassinet. While newborns don't yet have separation anxiety, nighttime can still be a difficult time for them. The stimulation of the day and transition to sleep can be tough. Since he's been hearing your voice for months now, as hearing develops in the womb, talking or singing helps soothe your baby and remind him that you are still present. Don't ignore your newborns cries. Newborns aren't yet capable of sleeping through the night in most cases, as their stomachs are too small to hold the calories required for the rapid growth they are experiencing. Pay attention to s bassinet's weight and length requirements and transition your baby to a crib when she outgrows to those measurements. Baby Center: Bassinet or Cradle?